Locals reject proposed huge Eldorado Gold dig in world heritage and tourism shrine. 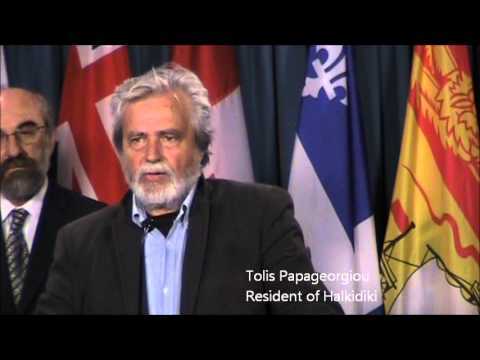 OTTAWA May 30, 2013 (Straight Goods News) ­ A delegation from northern Greece is in Canada to voice concerns over Vancouver-based Eldorado Gold Corporation’s proposed Skouries and Perama Hill mining projects. A delegation from affected communities Thrace and Halkidiki spoke at an event co- sponsored by Mining Watch Canada, the Council of Canadians, the Greek Canadian Committee for Ethical Mining, and the Pan-Thracian Society of Ontario. In their communities, they said, there is overwhelming opposition to the mining projects, and the climate is dangerous, violent and corrupt. Northern Greece residents says wholesale mine expansion is widely opposed in northern Greece and protestors are being brutalized. "Mining in the area has always been small-scale and underground, but even this small-scale activity has left the area with a legacy of pollution," said Maria Kadoglou of Hellenic Mining Watch. "We are now talking about a huge expansion of mining, incompatible with the scale of the Halkidiki peninsula which is not a desert but a densely populated area with a rich natural environment and cultural history — and the third most popular tourist destination in the country." She said, "The Greek government and Eldorado seem to believe that a project that is unwanted by the majority of the population can be imposed through violence, repression and penalization of protest… The government’s response to protest was to unleash the riot police. And thus every demonstration we have had in the past year has been met with tear gas, rubber bullets and beatings." The government’s response to protest was to unleash the riot police. And thus every demonstration we have had in the past year has been met with tear gas, rubber bullets and beatings. The group said Canada's international reputation has deterioriated due to projects like this, promoted as it is by the Canadian government with funding from Export Development Canada and investments by public pension plans. They say the project shows how Canada is attempting to cover for destructive and conflictive mining projects using the language of corporate social responsibility. Kadoglou said, "We want the Canadian government to stop promoting these disastrous mining projects that are opposed by the local communities in Halkidiki and Thrace. Greek citizens should be able to decide what kind of future they want." Since the delegation travelled to Canada, they say they have been observed by mine officials. "The General Director of Eldorado subsidiary in Thrace has come here all the way from Thrace because they are afraid that the Canadian public will be informed. The are coming here because they do not want the Canadian public and the Canadian government to find out what there Canadian mining companies are doing to Greece and to the rest of the world," said Vaggelis Lampakis, Mayor of Alexandroupoli, a region affected by the proposed mines. Samantha Bayard is a young journalist living and working out of Ottawa. She has been a contributor to the Straight Goods News family of websites since 2009. She is an avid cyclist and lover of animals.